Like I'm never going to subsist on chicken breast and do cardio seven times a week so that I can get ripped abs, I hate chicken breast. So dry. I have the abs that you get from eating chicken thighs. So I'm going to gently interrogate myself about how I feel about abs, maybe adjust that? Yes? No? Maybe gently interrogate myself about how I feel about chicken breast, maybe try them again? Back and forth like that. I mean, not in regards to chicken breast. I'm pretty decided about that. ANYWAY. Overall I'm trying to snap all the pieces of my self-care routine back into place: sleep, hydration, hygiene, nutrition, movement, and meditation. Hydration is as good a place to start as any: drink a glass of water when I wake up every day, I will write about that later. Right now I'm going to write about doing 750 words, which is sort of hors the above list. I suppose it's sort of mental hygiene, or it's meditation of a sort. Whatever. Words is words. 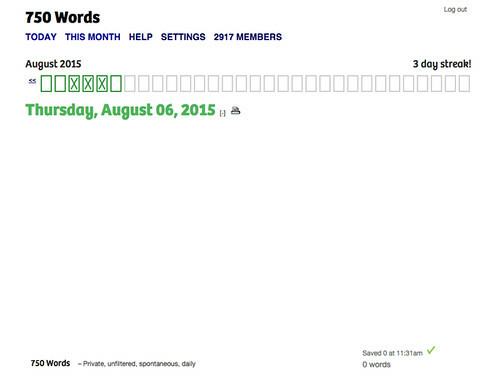 Words is pretty much the same as morning pages, and what I use for them is 750 Words. Which has a lot of bells and whistles that are just for funsies, he even says that they're just for fun. I find them distracting and just ignore them. I further ignore some of the parts that might be considered fundamental to the practice--e.g., writing every single day, and keeping a streak going. In the past I've done just Sunday/Tuesday/Thursday because how much sleep I needed because of derby, and that was fine. I've also done long streaks when words were really helping me, punctuated by long breaks when they really weren't. I may not be sure about captaining a big ship with a lot of souls, but I'm darn sure that I'm the captain of my own little boat with my one little soul. I sail how I want! I use 750 Words for its very basics: a white page, a keyboard (agree, typing is my most free-flowing writing), and a counter and a little green flag that pops up when I've hit my 750 words. As for what I use it for, it depends what I need it for. I'm not writing a novel or anything. Probably 80% of the time I'm narrating my life to myself, talking myself through getting through the day. First you drink the water and then you do the words and then you tidy the bedroom because they say that making the bed every morning gives you a little brain cookie to get you started and then you tidy the kitchen and then you fix your breakfast... it's horrifying, really, day in and day out. But that is pretty much why I picked this as my first Power 30 goal: if I want to rebuild my self-care routine, then I'll need to talk myself through it and it's better than buttonholing somebody on the bus. I'm not so down on social media, though; that might be a blessing of not having a smartphone. I don't think it's all a lie, either. Anyway I haven't been starting my day thinking about what other people are thinking about me, I've been starting my day solving murders (CSI), Claire wrote this thing a while back about watching TV at bedtime just because you can't stand your own thoughts, that, only lately like every waking moment, so like twelve hours of CSI a day. I could start that job today. Except, stomach contents. But I haven't been watching CSI since I started doing my words again! Good thing, because I seriously am about to run out of police procedurals. Do you know how many of those there are? Law and Order, CSI, Criminal Minds, NCIS? I have watched. Almost. All of Them. So, words. Starting the day by looking at myself: I feel like crap I slept terrible I dreamed that horrible dream, sure, I do that too. And then also sometimes I'll just write what needs to be written that day, which I could launch Blogger and write my post, it's the same white screen, it's the same activity. But Blogger doesn't count my words for me. So I write it all in here, cut and paste to Blogger, and hey, I have a blog post for the first time in six months. And hey now, TWO blog posts.